Derived from the Canadarm2 aboard the International Space Station, the neuroArm is a new tool to combat cancer. One of the tools used in the fight against cancer is, quite literally, out of this world. Research performed on the International Space Station and its predecessors, along with technology developed initially for work in space, play important roles in understanding the disease and improving treatments. When the Soviet Union launched Salyut 1, the first space station, into orbit in the 1970s, humans began spending more and more time in extremely low-gravity environments. On the International Space Station today, gravity ranges from 1,000 to 1,000,000 times less than the force experienced on Earth. These weightless environments are also known as "microgravity" environments, offering an invaluable platform for cancer research in space. On Earth, gravityflattens the cells in a lab, but in space they retain their rounded shapes. At the same time, in microgravity, the cells arrange themselves into three-dimensional groupings, or aggregates, that bear a strong resemblance to what happens inside the human body. Becker was the principle investigatorfor a space station experiment that focused on ovarian cancer cells, according to a NASA statement. Since 2003, the Japan Aerospace Exploration Agency (JAXA), has studied the high-quality crystals formed by protein molecules in space, where microgravity no longer causes flows based on density differences and the sinking of heavier particles. The resulting orderly formation of protein crystals may hold the key to treating diseases. One newfound protein, H-PGDS, plays a useful role in the treatment of muscular dystrophy. Another study, Cellbox-Thyroid, examines cancer at a cellular level. Building on findings from a previous investigation, Cellbox-Thyroid studies the spherical structure of cancer cells in microgravity and how they spread, potentially providing an improved understanding on what drives the cells. Not all space research requires a station. An artist's rendering of IGAR performing a biopsy. The robotic instrument is based on technology aboard the International Space Station. Doctors have plenty of experience fighting cancer on the ground. But astronauts in space are constantly bombarded by cosmic rays, a different form of radiation than is experienced on Earth, where gamma and X-ray radiation prevail. The different types of radiation can produce different changes in human DNA, the genetic material present in nearly every cell in the body. "In space, living organisms are constantly exposed to cosmic rays resulting in damages in DNA," Honglu Wu, of NASA's Johnson Space Center in Houston, told Space.com by email. "Whether the repair of these damages in space is different from that on the ground will impact the accuracy of assessment of health risks in the astronauts and the mutation rate of microorganisms in space." Wu serves as principle investigator for a new study, MicroRNA Expression Profiles in Cultured Human Fibroblast in Space (Micro-7), which examines the effects of microgravity on DNA damage and repair. The experiment induces DNA change using a chemotherapy drug, and observes how microgravity affects the mutations not only in DNA but also in the microRNA that regulate gene expressions. Changes in the microRNA in microgravity can affect how the cell responds to DNA damage in space. Although the experiment focuses on cancer caused by long exposure in space, it may have ramifications for the Earth-based mutations. "If our study can identify microRNAs that are associated with the repair of DNA damages, manipulating these microRNAs in tumor cells will hopefully increase the sensitivity to radiation treatment." Embryo Rad is a radiation experiment that will search for the transgenerational effects of radiation exposure in rodents. Frozen mouse embryos will fly in the radiation environment of space. On their return to Earth, they will be implanted in surrogate mothers. Scientists will observe possible changes in life spans, as well as cancer development or gene mutations, in order to better understand secondary cancer risks involved in ground-based radiation therapy for humans. Paige Nickason, the first patient to have brain surgery performed by the robotic neuroArm, points to the location where she had a tumor removed. A robotic arm onboard the space station has inspired a medical tool to combat cancer. The Canadian Space Agency's Canadarm, Canadarm 2 and Special Purpose Dexterous Manipulator (Dextre) helped build and maintain the space station, and provide heavy lifting and space berthing capabilities. But for neurosurgeon Garnette Sutherland, they also provided the seed for a robot that could operate inside a magnetic resonance imaging (MRI) machine. Sutherland contacted Macdonald Dettwiler and Associates (MDA), the company that built the space station arms, about the possibility of creating a new medical tool. The company's space engineers worked in collaboration with the University of Calgary to create neuroArm. By operating inside an MRI machine, neuroArm performs microsurgery by using detailed brain images. It is also capable of performing biopsies. A doctor controls the tool from the outside, while the arm itself negates tremors and unintentional movements caused by the human arm, allowing for greater precision. 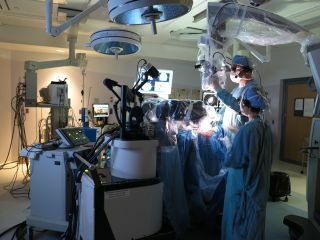 "In building neuroArm, engineers from MDA were challenged to recreate the sight, sound, and touch of surgery at a remote workstation," Sutherland told Space.com by email. "We sometimes say, when using neuroArm, its telecapability allows the merging of the precision and accuracy of machine technology with the executive capacity of the human brain." Because Sutherland is a neurosurgeon, the tool has primarily been used to operate on brain tumors, and has been utilized in approximately 60 cases. The Canadian Space Agency arms also inspire another robotic toolto combat breast cancer. The Image-Guided Autonomous Robot (IGAR) also works in combination with an MRI scanner to take biopsies with an accuracy of three-tenths of an inch (1 millimeter), which improves sampling, reduces pain, and decreases time spent in the MRI suite, thus reducing the amount of money spent.